We’d love your help. Let us know what’s wrong with this preview of Calling All Minds by Temple Grandin. Have you ever wondered what makes a kite fly or a boat float? Have you ever thought about why snowflakes are symmetrical, or why golf balls have dimples? Have you ever tried to make a k From world-renowned autism spokesperson, scientist, and inventor Temple Grandin -- a book of personal stories, inventions, and facts that will blow young inventors' minds and make them soar. To ask other readers questions about Calling All Minds, please sign up. This book was a little awkward to me. It was part personal memoir, part science experiments, part history. I liked what I learned in the book, but I think I would have preferred if it focused either more on her personal history or invention history. It just seemed disjointed to me and I wasn't sure where the narrative was going. Some of the home experiments seemed like they could be fun and different for children to try. The activities in the book are real experiments. It requires the kids to th This book was a little awkward to me. It was part personal memoir, part science experiments, part history. I liked what I learned in the book, but I think I would have preferred if it focused either more on her personal history or invention history. It just seemed disjointed to me and I wasn't sure where the narrative was going. Some of the home experiments seemed like they could be fun and different for children to try. The activities in the book are real experiments. It requires the kids to think and tweak their project beyond the basic instructions that are given to them. They have to try different fabrics for the kite, adjust the position of the wings on the airplane, it goes beyond robot copying that happens when children are presented with a craft project and try to mimic what the example is. It requires them to problem solve. An interested reader could get behind one of two things in this book where Grandin "calls all minds". The historical text boxes that highlight inventions throughout history OR the biographical story she weaves and the science she shares to do fun things like create kites and water bombs. The interspersed text boxes highlighting these historical figures is important to the context celebrating all of the minds that went into creating these inventions (first woman, first African American, etc.) but An interested reader could get behind one of two things in this book where Grandin "calls all minds". The historical text boxes that highlight inventions throughout history OR the biographical story she weaves and the science she shares to do fun things like create kites and water bombs. The interspersed text boxes highlighting these historical figures is important to the context celebrating all of the minds that went into creating these inventions (first woman, first African American, etc.) but their perseverance or ineptitude that led to the accident that led to the discovery. Yet, it's sort of distracting, it's like reading two books in one. Temple Grandin is an inspirational person! This book has great information for budding inventors. It is a YA book with 25 projects. Read the book to find out Temple Grandin is an inspirational person! This book has great information for budding inventors. It is a YA book with 25 projects. I was really excited to read this because in my line of work I hear a lot about Temple Grandin. And though this book was good with interesting facts and a lot of cool ideas to do with the kids I really wanted to know more about her and her life with her autism diagnosis. I will have to look around and find more from her because her story is definitely interesting to me. 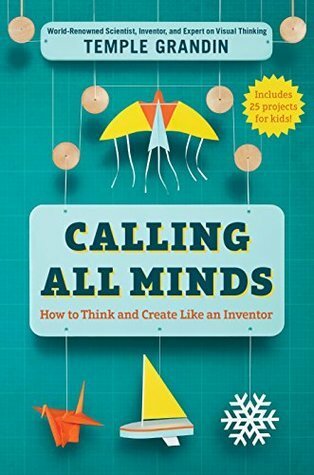 Recommendations & Comments: Not only does this book talk about various inventors, Ms. Grandin’s own background and discovery is very interesting. You even get directions on how to make several inventions! The introduction is read by Temple herself, but the rest of the book is read by Ann Richardson. I prefer Temple’s narration, because the speech pattern matches the text well. She also explains a little bit about her autism and I think many kids will relate to being different and will like knowing they can still be successful. Get away from the screens and discover this hand-on book! I am a huge fan of Temple Grandin, and I enjoyed this book very much. I think it leads the reader to a lot of new and different things, and gives many opportunities to connect with something you like to do. maybe best for an young middle grade reader, but very easy to understand and the projects are great! Need some inspiration to finish those art projects? Temple Grandin won't take no for an answer. This book is partly instructions on the types of things kids used to do before TV invaded our brains, and partly a call to action. Will really speak to your maker kids. For me, this was a 3 star, but she tells the story of how to build things using Physics. I teach Physics, so there really wasn't anything novel, but I imagine someone who needs some lightweight Physics might enjoy this. It is too bad I can't access the PDF with this Audio book. This is a good book by Temple Grandin. It is focused toward young people with several activities spelled out in which people can practice building mechanical instruments. It also tells stories about Grandin's life and how she achieved greatness, despite many difficulties. A nice example of bottom-up thinking by using simple inventions. and knew she was a person with high functioning autistic but that was about it. I have known people from Non-verbal Autistic to Asperger Autistic. I wasn't sure if it would be too above my head super genius, or too boring and remedial. What I found was a fun book. Well told, interesting, and now I have about 7 projects I want to try. (She gives you the directions) It also gives me a better insight into autism. She grew up in a world that didn't understand autism. She stated that she is almost 70 years old, and over time, she has learned to overcome some of the autism quirks, (Like social interactions, public speaking, etc). I like that she sees her condition as something she can change and adapt! That is cool! I like that she points out the most inventors, and scientists were probably autistic and that sort of wiring, seeing pictures etc make for good scientific and investors. One attribute is because of the hyper focus. As we know there are all levels, and all spectrum's of autism so she isn't the poster child of how to be a successful person with a mostly non understood, condition . She is great at encouraging kids to "lay down the video games" and do things with your hands. " I like that she advocates for computer use, but that this generation are missing out on hands on things in school like auto mechanics and shop. I listened to the unabridged MP3 audio version of this title (read by Ann Richardson, Listening Library, 2018). Mary Temple Grandin [1947-now], Professor of animal science at Colorado State University and consultant to the livestock industry on animal behavior, has been featured in several films, including one bearing her name (2010), “In the Woods” (2012), and “Speciesism: The Movie” (2013). In this book, Grandin aims to inspire young readers to put down their phones and to pick up scissors, glue I listened to the unabridged MP3 audio version of this title (read by Ann Richardson, Listening Library, 2018). In this book, Grandin aims to inspire young readers to put down their phones and to pick up scissors, glue, milk cartons, and other tools/materials to build some of the things she herself worked on as a kid, relating her own experiences and challenges as she tried the projects. Some two-dozen projects, grouped into five sections (paper, wood, levers/pulleys, objects that fly, and optical illusions) are presented, along with descriptions of underlying inventions and patents. An accompanying PDF file includes drawings, photos, and images of patent applications. As a spokesperson for autism, Grandin has given many seminars and talks, including this 20-minute TED talk, entitled “The World Needs All Kinds of Minds.” She is not the best speaker, because, as she indicates in her talk, she is a visual, detail-oriented thinker and has trouble dealing with abstractions. But, it’s still good to hear her views and learn about her success story. Inspiring STEM book! Temple Grandin does a great job encouraging experimentation and hands-on knowledge for young learners and demonstrating the importance of bottom-up thinking, different ways people learn and interact, deductive reasoning, problem-solving, and patience. I learned a lot from an Grandin's multiple examples of historical inventors and inventions that changed the world. This book offers simple instructions for various projects that use recycled items and scraps to teach basic conce Inspiring STEM book! 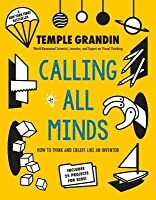 Temple Grandin does a great job encouraging experimentation and hands-on knowledge for young learners and demonstrating the importance of bottom-up thinking, different ways people learn and interact, deductive reasoning, problem-solving, and patience. I learned a lot from an Grandin's multiple examples of historical inventors and inventions that changed the world. This book offers simple instructions for various projects that use recycled items and scraps to teach basic concepts and design. Temple Grandin speaks frankly about her social issues which she explains was the worst in high school, and is positive about how shared activities with peers, like building rockets, helped with the social tension. I appreciate the cultural shift that Silicone Valley has fostered, an appreciation for and pride for nerds that I believe is well deserved. This innovative book will inspire and educate the geniuses of the future! Temple Grandin invites young inventors to explore the world with her. Encouraging them to ask questions about everyday things, such as: How do pulleys work? What causes metal boats float? Who invented the sewing machine? Using personal history as well as engaging projects for readers to experiment scientific principles, Grandin not only makes science practical, but obtainable. Was excited to read this, but the first section, on the history of papermaking (an area I feel passionate about) was so inaccurate that I could not continue. This book has either been dumbed down for children (inappropriate) or is an example of incredibly poor research -- in either case, I am vastly disappointed. This was an interesting book to listen to. I would like to actually see it because there is a lot going on here... personal stories, history of inventions and inventors, projects to create etc... It seems like it would be a good addition to a maker space library. I heard Temple Grandin speak this week. She talked about all the things in this book, things she noticed because she is a visual thinker. The book includes hands on projects for "tinkering." Teachers would benefit from listening to what she has to say about learning and learners. I have a signed copy of this book from when we were able to listen to the author speak at the library. Such a neat experience. Mix of experiments and history of scientific discoveries. Fantastic and inspiring stories of science, autism, and the value of the differences that make us unique. This book has projects you (and your child, if you have one of those) can make.